Live Learn Shine On: 70-Year-Old Qualifies For Olympics! 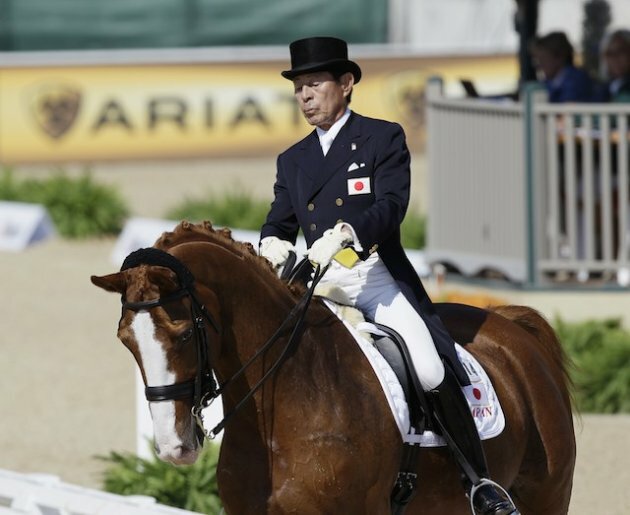 Four years ago, Japanese equestrian Hiroshi Hoketsu was the oldest Olympian to compete in the Beijing Olympics. On Saturday, the 70-year-old rider made a bid to become the oldest competitor in London, too. Hoketsu qualified for the 2012 Summer Olympics this last weekend by winning an international dressage meet in France. He was aboard the 15-year-old Whisper. "To put it pompously," he told reporters, "it was a miracle. Last summer, I thought it would be impossible to make London, so it fills me with deep emotions." Japanese officials have yet to announce whether Hoketsu, who will be 71 by the time of the Opening Ceremony, will compete. Hoketsu made his Olympic debut in his his native Japan in 1964, finishing 40th in show jumping. He qualified again in 1988 but was unable to compete when his horse was quarantined. In Beijing, Hoketsu finished 35th out of 47 competitors in the individual dressage event. The oldest Olympian in history was Oscar Swahn, who competed in the 1920 Antwerp Games at the age of 72. He earned a silver that year as part of the Swedish double-shot running deer team. Swahn won an individual gold medal in his first Olympics in 1908 at the tender age of 60. He won a team gold four years later in Stockholm. Though he was defending champion in the running deer shooting, single-shot competition, Swahn only managed fifth place in those 1912 Games. The winner was a 32-year-old named Alfred. He was Oscar's son.